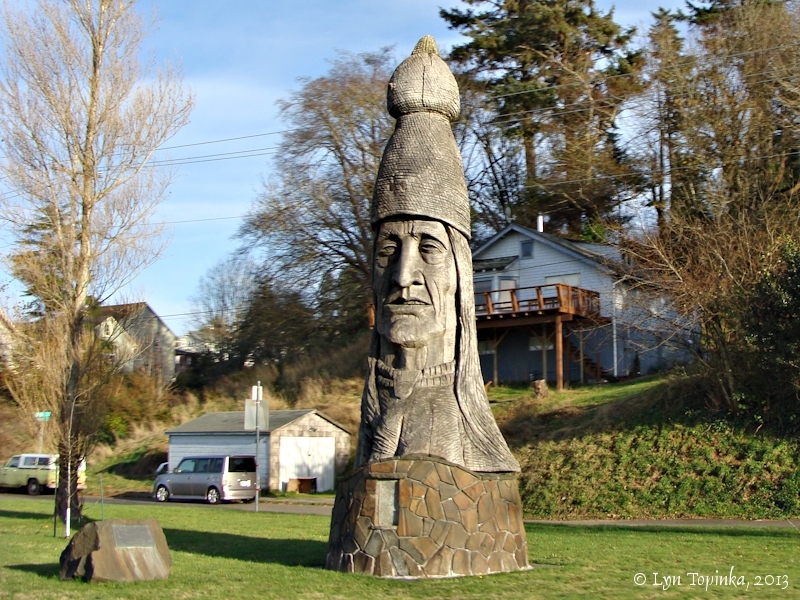 The Columbia River - "Whispering Giants"
Click image to enlarge Whispering Giant scupture, "Ikala Nawan", Astoria, Oregon. Photographed from moving car. Image taken August 13, 2013. 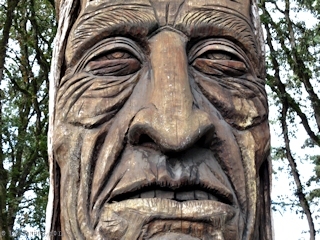 According to the "wikipedia.org" website (October 2014), Hungarian-born scuptor Peter Wolf Toth has created 74 large wood sculptures ranging in height from 20 to 40 feet, with at least one each in each of the 50 States, as well as Ontario and Manitoba, Canada. This collection is known as the "Trail of the Whispering Giants". 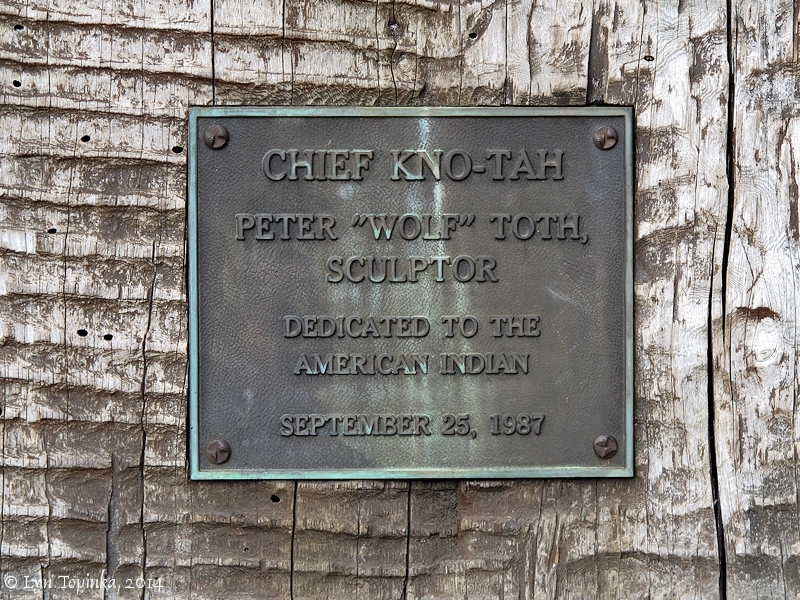 Peter Wolf Toth's first Giant sculpture in the Pacific Northwest was carved from White Fir, and was located in Vancouver, Washington. 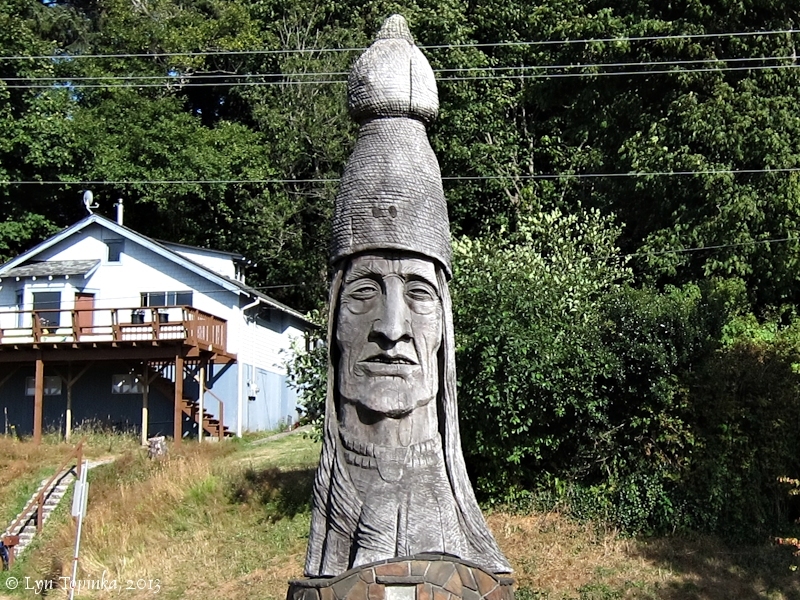 This sculpture, Toth's 11th Giant, was carved in 1974 and was 25-feet high. It was removed from display in 1992, most likely due to deterioration from weather. 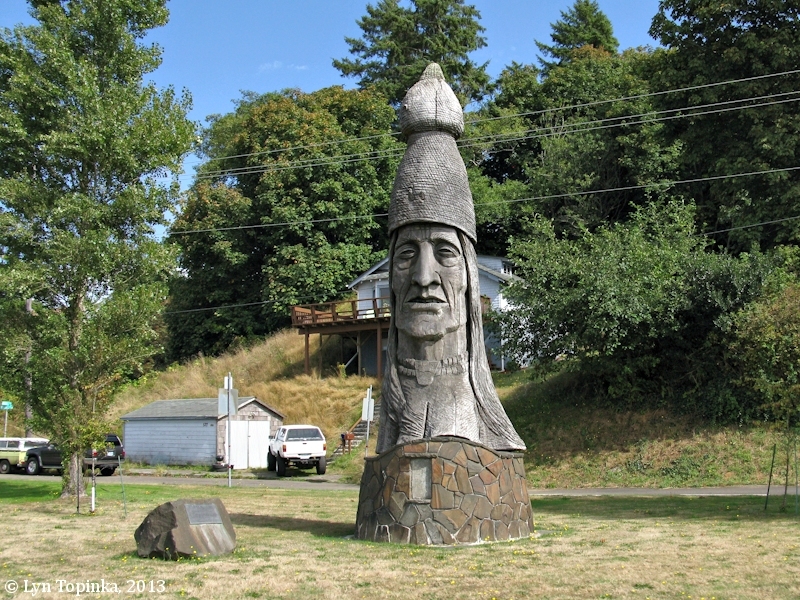 Click image to enlarge Penny Postcard: Whispering Giant scupture, Vancouver, Washington. Penny Postcard ca.1980s. 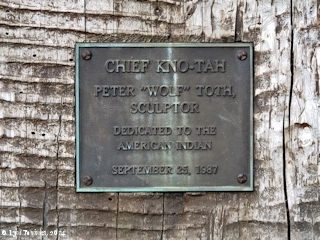 Caption on back: "Toth's Nationwide Indian Sculptures (with a cause). Sculptor Peter Toth's gift, one monument in each of the 50 states, to raise the Nation's conscience to the plight of the American Indian. Created from a 42,000 lb. fir; 25 ft. high; 8 ft. across. Appeared in "Ripley's Believe It or Not." 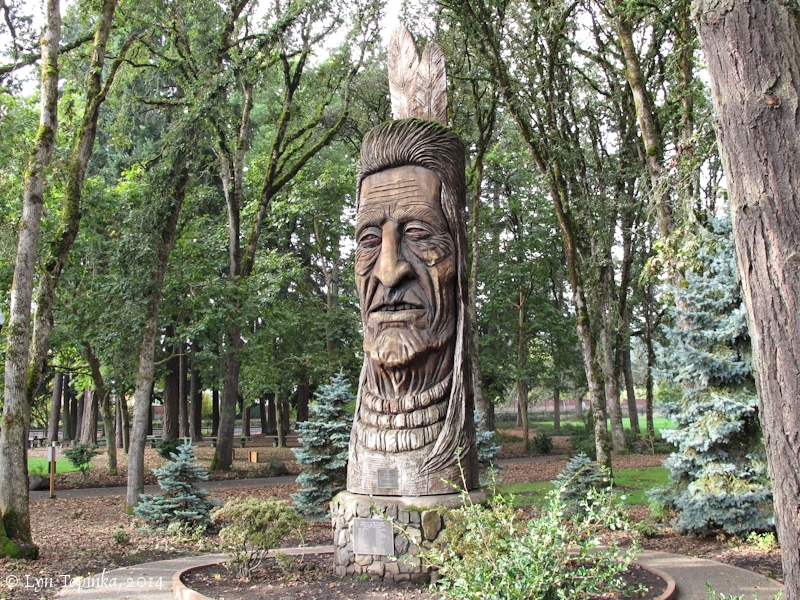 Located in Esther Short Park in Vancouver, Washington." Photo by Greg Johnson. In the private collection of Lyn Topinka. 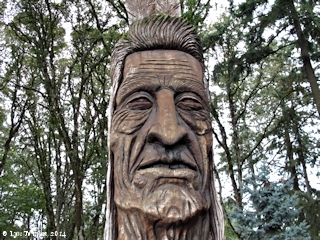 Oregon's first Giant, "Chief Kno-Tah", was created in 1987 and is located in Hillsboro, Oregon. 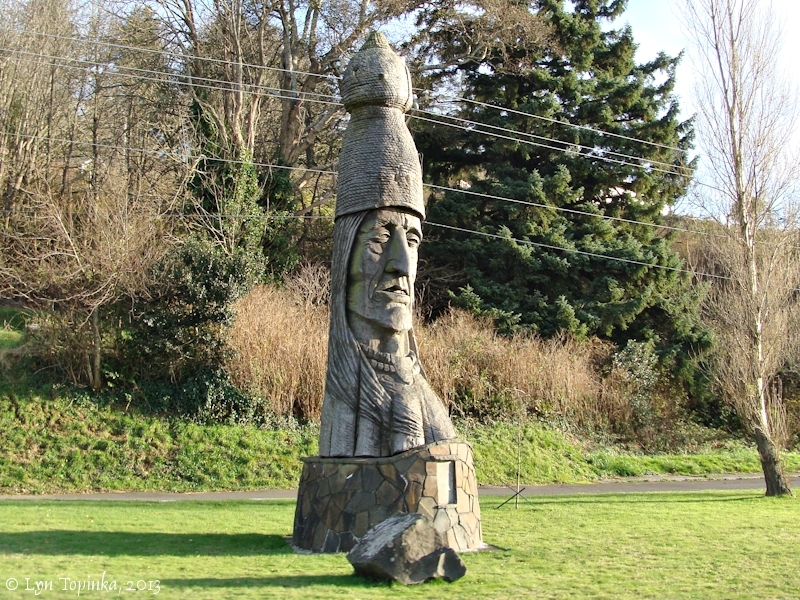 This sculpture was carved into a Doublas Fir log, and is a head of a Native-American man wearing feathers and braided hair. It is approximately 25 feet high and 6-feet in diameter, and is sitting on a two-foot-high concrete base. 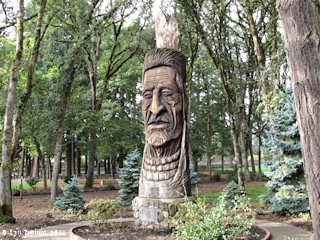 According to "wikipedia.org" website (retrieved November 2013), "Kno-Tah" was the leader of the Tualatin band of the Kalapuya group of Native Americans when that band signed a treaty with the government to cede their ancestral home on the Tualatin Plains. 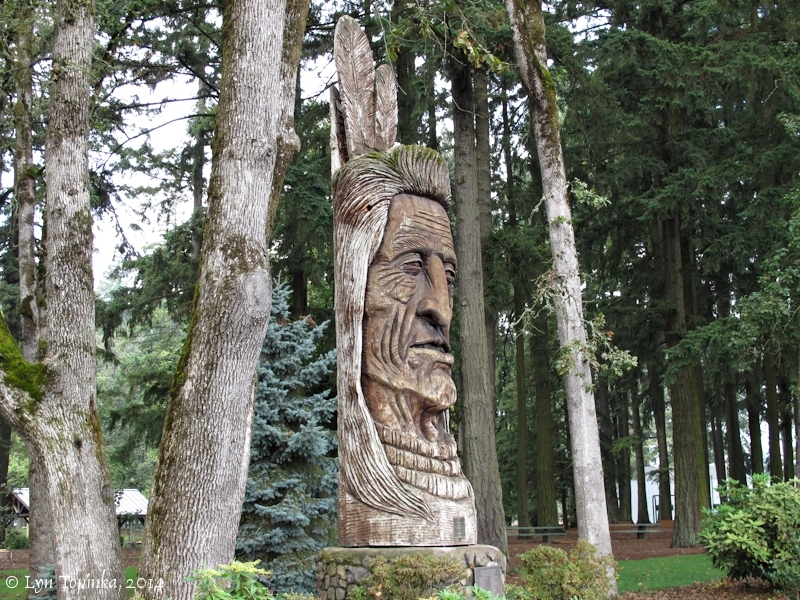 Students at the Chemawa Indian School in Salem, Oregon, selected the name from submissions from local residents. 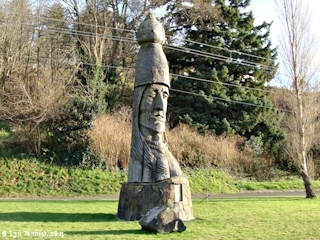 The 25-foot-high sculpture was Toth's 56th giant. 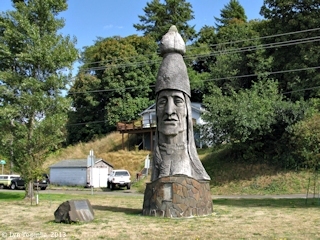 Click image to enlarge Whispering Giant scupture, "Chief Kno-Tah", Hillsboro, Oregon. Located in Shute Park. Image taken October 19, 2014. Click image to enlarge Plaque, Whispering Giant scupture, "Chief Kno-Tah", Hillsboro, Oregon. Located in Shute Park. Image taken October 19, 2014. 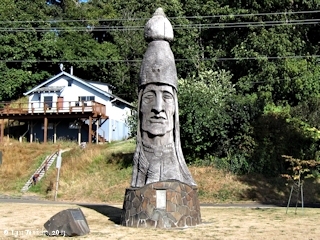 Oregon's second Giant, "Ikala Nawan" ("Man Who Fishes"), is located in Astoria, Oregon and was Toth's 57th Giant. It was carved in 1987 out of cedar log and placed on a concrete base. 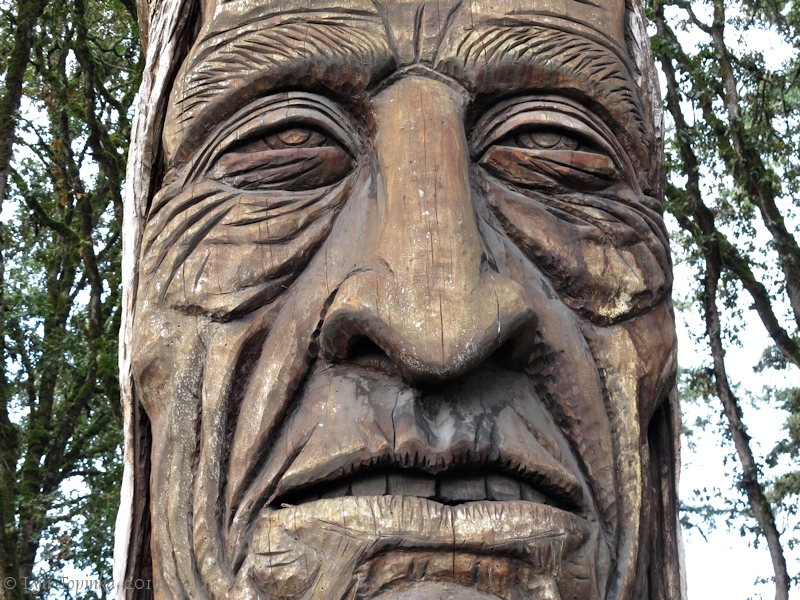 The head is approximately 18 feet high and 9 feet in diameter. The base is approximately 5 feet high and 15 feet in diameter. 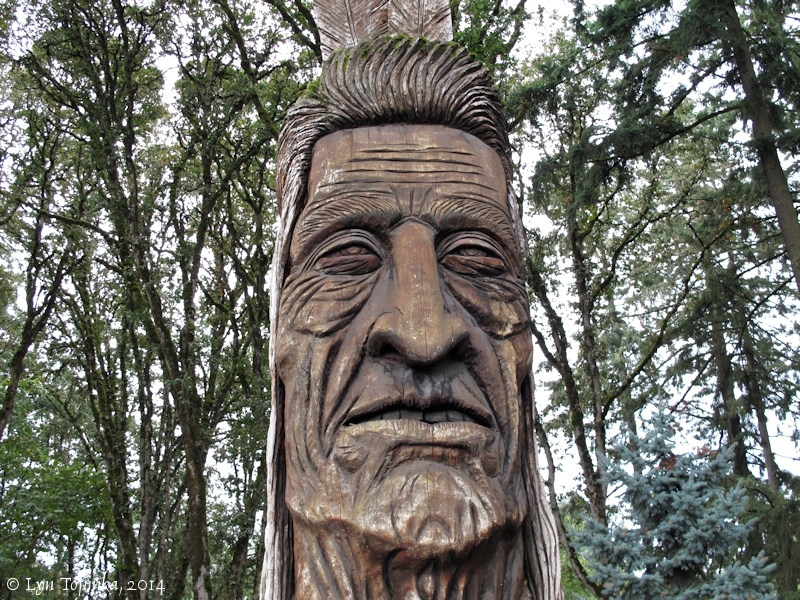 The sculpture is to honor the Chinook, Clatsop, and all Northwestern Coastal Indians. Click image to enlarge Whispering Giant scupture, "Ikala Nawan", Astoria, Oregon. Photographed from moving car. Image taken September 4, 2013. Click image to enlarge Whispering Giant scupture, "Ikala Nawan", Astoria, Oregon. Photographed from moving car. Image taken November 25, 2013.